Crayfish make surprisingly complex, cost-benefit calculations, finds a University of Maryland study - opening the door to a new line of research that may help unravel the cellular brain activity involved in human decisions. The Maryland psychologists conclude that crayfish make an excellent, practical model for identifying the specific neural circuitry and neurochemistry of decision making. They believe their study is the first to isolate individual crayfish neurons involved in value-based decisions. Currently, there's no direct way to do this with a human brain. The study will be published in the Proceedings of the Royal Society B, and is being released online by the journal today. "Matching individual neurons to the decision making processes in the human brain is simply impractical for now," explains University of Maryland psychologist Jens Herberholz, the study's senior author. "History has shown that findings made in the invertebrate nervous systems often translate to more complex organisms. It's unlikely to be exactly the same, but it can inform our understanding of the human brain, nonetheless. The basic organization of neurons and the underlying neurochemistry are similar, involving serotonin and dopamine, for example." Herberholz adds that his lab's work may inform ongoing studies in rodents and primates. "Combining the findings from different animal models is the only practical approach to work out the complexities of human decision making at the cellular level." The experiments offered the crayfish stark decisions - a choice between finding their next meal and becoming a meal for an apparent predator. In deciding on a course of action, they carefully weighed the risk of attack against the expected reward, Herberholz says. 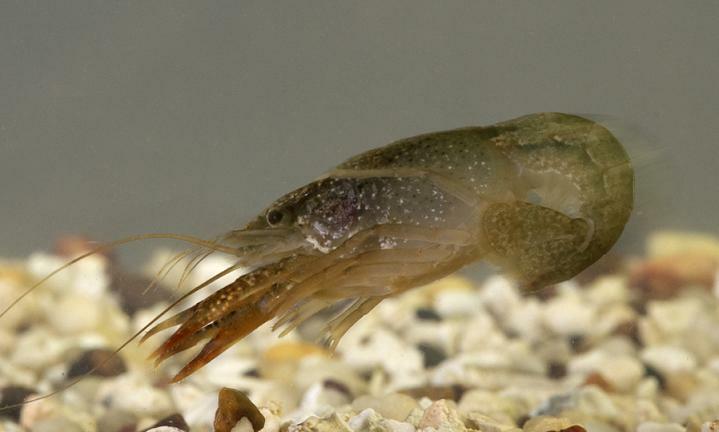 Using a non-invasive method that allowed the crustaceans to freely move, the researchers offered juvenile Louisiana Red Swamp crayfish a simultaneous threat and reward: ahead lay the scent of food, but also the apparent approach of a predator. In some cases, the "predator" (actually a shadow) appeared to be moving swiftly, in others slowly. To up the ante, the researchers also varied the intensity of the odor of food. How would the animals react? Did the risk of being eaten outweigh their desire to feed? Should they "freeze" - in effect, play dead, hoping the predator would pass by, while the crayfish remained close to its meal - or move away from both the predator and food? To make a quick escape, the crayfish flip their tails and swim backwards, an action preceded by a strong, measurable electric neural impulse. The specially designed tanks could non-invasively pick up and record these electrical signals. This allowed the researchers to identify the activation patterns of specific neurons during the decision-making process. Although tail-flipping is a very effective escape strategy against natural predators, it adds critical distance between a foraging animal and its next meal. The crayfish took decisive action in a matter of milliseconds. When faced with very fast shadows, they were significantly more likely to freeze than tail-flip away. The researchers conclude that there is little incentive for retreat when the predator appears to be moving too rapidly for escape, and the crayfish would lose its own opportunity to eat. This was also true when the food odor was the strongest, raising the benefit of staying close to the expected reward. A strong predator stimulus, however, was able to override an attractive food signal, and crayfish decided to flip away under these conditions. "Our results indicate that when the respective values of tail-flipping and freezing change, the crayfish adjust their choices accordingly, thus preserving adaptive action selection," the researchers write. "We have now shown that crayfish, similar to organisms of higher complexity, integrate different sensory stimuli that are present in their environment, and they select a behavioural output according to the current values for each choice." The next step is to identify the specific cellular and neurochemical mechanisms involved in crayfish decisions, which is more feasible in an animal with fewer and accessible neurons, Herberholz says. That research is now underway.